Chicago St. Barbara High School "Bandits"
Courtesy of "A History of the Offices, Agencies, and Institutions of the Archdiocese of Chicago"
Chicago (population 2.7 million) is located in northeastern Illinois in eastern Cook County. Lake Michigan, the Chicago and Illinois Rivers, and the Des Plaines River are the main waterways to and from town. I-90, I-94, I-55, and I-57 will all lead you to the "Windy City". From what started as a small village in the early 1800's, Chicago has grown to the nation's third largest city and one of the most famous places in the world. Chicago's many ethnic neighborhoods and religious factions have made it a real "melting pot" over the years. The creation of St. Barbara parish and its subsequent high school were a part of this early development. St. Barbara catholic parish was conceived in 1909 in response to the growing Polish Catholic population in Chicago's near south-side Bridgeport neighborhood. 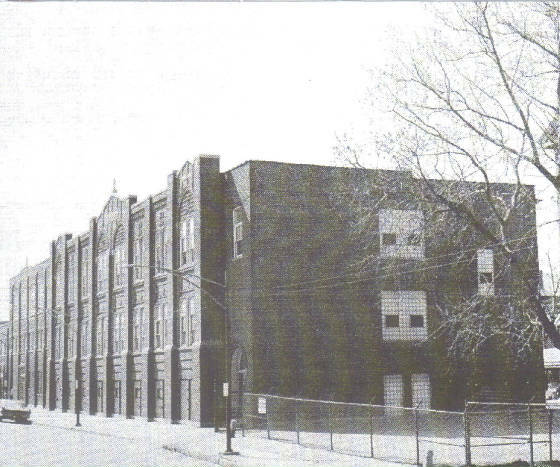 St. Barbara Catholic Grade School was opened in 1910 at 29th Street and Throop Street. The building of the St. Barbara Church was finished in 1914. St. Barbara Catholic Grade School was growing rapidly with over 1,100 stuidents in its eight grades in 1923. The first hint of a high school program came in 1924 with the development of a two-year "commercial school" to help young people find office jobs. A new high school building was constructed in 1924 to house the commercial school classes. In 1947, the school became a four-year catholic high school for girls only. St. Barbara High School served in this capacity for 56 years. Enrollment for the school peaked in 1985 with 372 students. The late 1990's brought about concerns of financial issues stemming from low enrollment. The announcement was made in February of 2001 that St. Barbara High School, with an enrollment at 85 students, would be closing. The fate of the St. Barbara school building is needed. St. Barbara HS team nickname: "Bandits"
St. Barbara High School girls had some nice seasons during the 27 seasons the school competed in IHSA sports. The records of the teams and the coach's names are items that are needed. Also needed are the school team nickname, uniform colors, and fight song. All information listed below was obtained on the IHSA website (www.ihsa.org). The St. Barbara softball team of 1988 had some lively bats. The overall batting average of the girls on the team was an incredible .413 - good for the tenth best effort in IHSA history!! This sport likely produced several good teams and athletes. The only mention of the program however was for a reason not in St. Barbara's favor. In a game against St. Francis de Sales in 1996, de Sales shot an incredible 112 shots, a record that stands today. The only IHSA hardware won was earned by the lady netters. St. Barbara had a nice string of seasons in the late 1970's and early 1980's. The program won three titles in a four year span. Coach's names and team records of these teams are needed. Do You Have Any Information You Would Like to Share?